I have just released version 0.2.1 of libdpfp, a userspace library with example programs to interact with Microsoft and DigitalPersona fingerprint scanners on Linux. 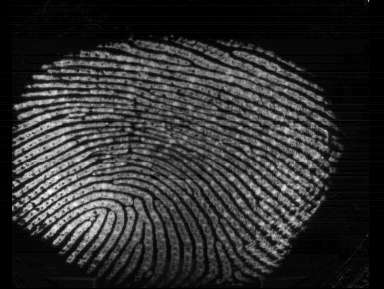 This release contains code from eFinger and FVS to enhance the fingerprint images. The capture_finger_enhanced example program now produces images like the ones in this post, which is rather cool. Again, the enhancement takes a few seconds to complete, hopefully we can improve on this. Also, I think I saw an infinite loop in the thinning code, but have been unable to reproduce this. Andrei Tchijov has done some work porting libdpfp to Mac OS X (Darwin). I say porting, only a few small changes were needed. It doesn’t work out-of-the-box on Darwin just yet due to a libusb bug, which Andrei is working on. Andrei also mumbled something about porting libdpfp to Windows, which would be rather interesting. Download link. As usual, questions and bug reports belong on the mailing list, not in comments on my weblog. I’ve had an enjoyable first few days in the US (Boston, MA). My apartment is really nice (considerably nicer than the student places I’ve been in for the last 2 years! ), plus Dave (flat mate) and Seemant + Aimee have been really helpful in terms of getting me settled in. I’ve figured out the public transport system and ventured into the city a few times. As I don’t start working until September, I’m enjoying having the time just to wander around with a slightly alienated feeling (everyone talks funny, drives on the wrong side of the road, etc) and no real commitments as of yet. The banking system is weird. The high street banks here seem to lack the efficiency which I’m used to back at home. And what’s this about paying monthly fees just to have a basic account? Savings accounts which offer only 0.40% interest? Having to pay to get a cheque checkbook? Holes in the mobile cell phone network… Having a tri-band phone on a UK network allows me to connect to any GSM network out here, but reception of any network in my apartment is basically non-existent. Things don’t even get much better in the local town area, although it was OK in the city. It has also been an educational experience. I now know the value of a dime (why is a 10 cent coin smaller, thinner and lighter than a 5 cent coint!? ), and discovered what a corn dog actually is (haven’t tried one yet, but this Americanism had been bugging me for a while). On Friday (my 20th birthday) I met with Dave & Megan and friends, Seemant & Aimee, Mike Frysinger and Joshua Nichols. We ate at a nice bar in the city, which was fun. I hope we can meet up again soon, once I’ve adjusted to the timezone. Finally, I hold, within the grasp of my hands, a one-year US visa. It only took several months of paperwork and a 5 hour wait on the pavement outside the US embassy for a 30-second interview to get to this point. I’m flying out on Tuesday, which is veeery soon. I’ll be living in Lexington, MA (just outside Boston). It’s my 20th birthday on 25th August (next friday). As I won’t really know many people at that point, I’m hoping to get a few members of Gentoo’s boston conspiracy together for a meal or something, suggestions appreciated. Hopefully the worst of the jet lag will have worn off at that point. Also hosting a joint leaving-and-nearly-birthday BBQ celebration at my house on Saturday. Hopefully it will have stopped raining by then. I released libdpfp 0.2.0 yesterday. This library allows you to capture images from Microsoft/DigitalPersona fingerprint scanners. Download link. It does not yet include the more advanced image enhancement code which I wrote about recently, I will be adding that soon. The big change in this release is that it drops dependence on a kernel-side driver and having to upload firmware. libdpfp is now standalone. Not requiring firmware avoids the potential distribution issues we had: we don’t have the rights to distribute their firmware. It is now not required because the device stores it, and even brand new devices seem to ship with the firmware already saved on the device. One reason we might need the firmware again is to disable encryption, but I’m reasonably confident we can do that without a firmware image — just waiting for someone who has a device which is encrypting images to come along so that I can test a theory. The kernel-side driver is no longer required, all USB I/O is now done inside libdpfp itself, through libusb. This simplifies things for users quite substantially, and it’s much nicer writing drivers in userspace than in the kernel. It also means that ports to BSD and even Windows are now realistically possible (if someone contributes the code! ), and means good things for users running old kernels on embedded devices. Bug reports and questions belong on the mailing list, not in comments on this weblog entry. Thanks!